Today we’ll update on one case that demonstrates how Chiropractic can benefit kids as much as their parents when life impairs their spinal health. As we discussed last week, life can take a toll, at any age. The common perception is that kids bounce back from just about anything, which is true. But that doesn’t mean they are invincible. The good news is that it also means a little bit of intervention can yield noticeable improvements in a relatively short period of time compared to their parents. Our Dr. McLaughlin recently had a patient, a 40-year-old mother, who decided to get her son checked. 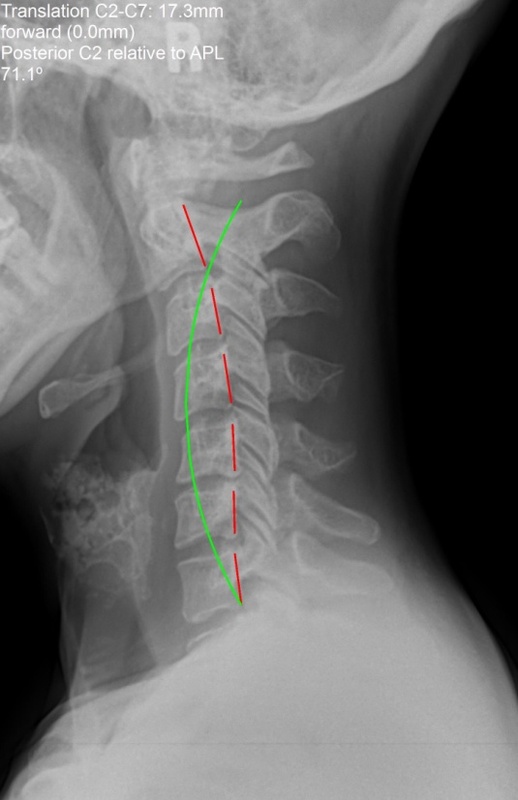 She was shocked to discover her son had poor neck alignment, but completely understood the need to address it now so he doesn’t end up with the same issues she has as he gets older. That’s often how it starts. Parents come to our Kanata Chiropractic clinic with issues that are leaving them with chronic pain in the neck, shoulders, upper back, or in the form of headaches. They often suffer from lost mobility and have come to depend on pain medications to function. Then they get their kids checked too and discover the problems begin long before you are a parent or hitting middle age. Here’s an update on one case we talked about a few years ago. A then 10-year-old boy on the autism spectrum who just loved his iPad had the “text neck” to show for it. 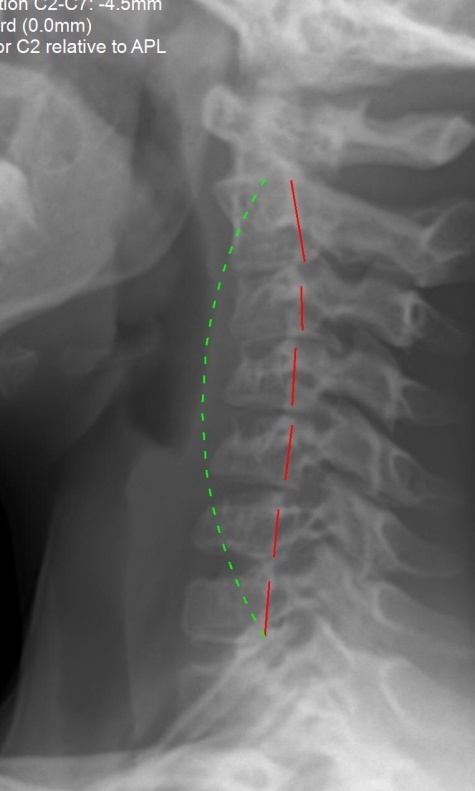 Both of his parents were and still are patients, and brought him in for an examination for no other reason than to ensure his spine was in optimal health. prognosis for chronic pain, lost mobility, and poor quality of life. And he was only 10 years old. He had never been in a car accident or suffered any other kind of trauma that would account for his condition. The only apparent contributing factor was his time crouched over his iPad. In fact, his loss of curvature at this young age was almost identical to that of his mother, a 42-year-old woman who had decades of time hunched over computer keyboards and her sewing machine to account for her poor spinal health. You can see her x-ray shows similar misalignments. Fast forward to August 2017. We can see from the last set of x-rays for mom and son some noticeable improvements. 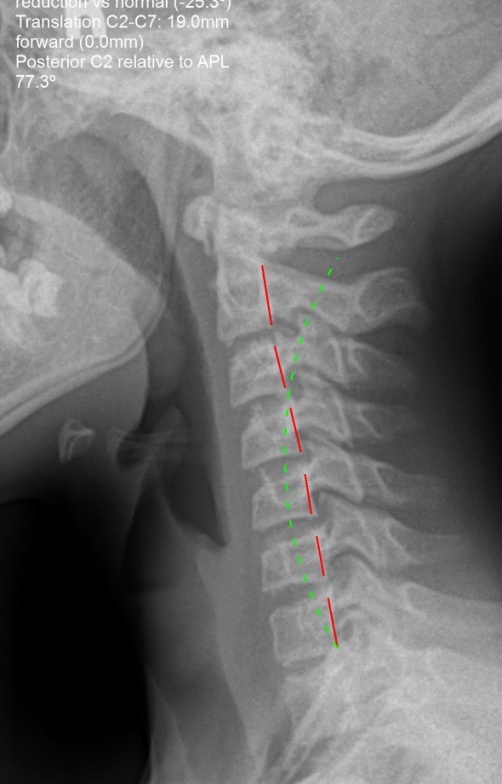 They are still far from perfect, but any restoration toward normal alignment is a positive. 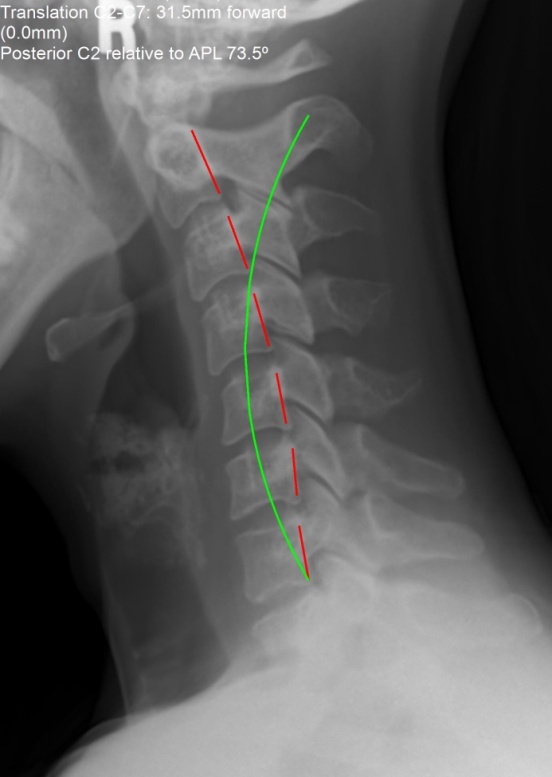 In the son’s case, we see a total change of 522.2 per cent in his head position and of 112.8 per cent in his neck curve. For the mother, the gains have been less dramatic, which can largely be accounted for by her age, but still significant. Her head position has improved by 45.1 per cent and her neck curve by 9.5 per cent. A big part of the recovery for both of them was the homework we assigned. They do an at-home neck exercise with a traction device – a Denneroll – for about 18-20 minutes four or five times a week. It helps to restore the neck’s natural curve. And they’ve seen these improvements despite the fact that the son’s iPad habit is as bad as ever, while his mother spends no shortage of time huddled over her own iPad or her latest sewing project. So we have managed to stop and partially reverse the issue despite the fact they continue to pursue the activities that aggravate it.